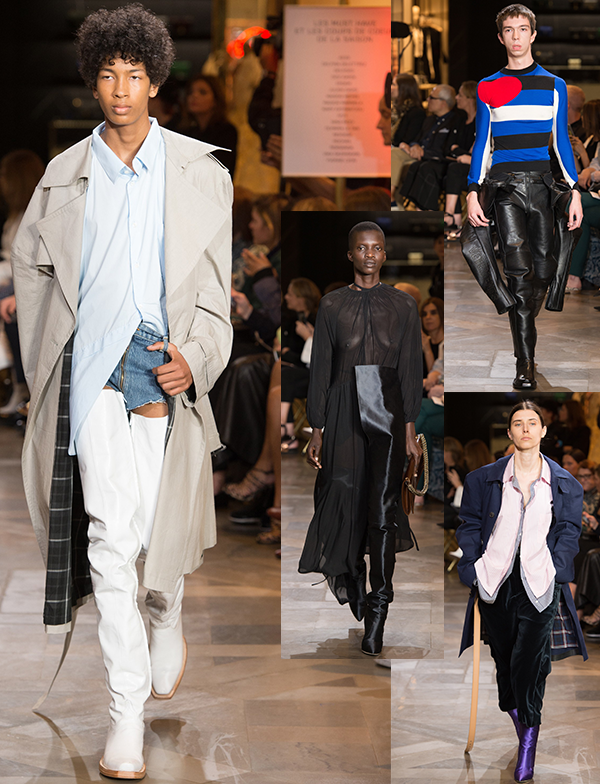 Vetements as a stand-alone brand is a force to be reckoned with but for their RTW Spring 2017 collection, they had a little help of industry friends including Brioni, Schott, Levi’s, Comme des Garçons Shirt, Reebok, Canada Goose, Dr. Martens, Alpha Industries, Juicy Couture, Eastpak, Lucchesse, and Manolo Blahnik. Taking everyday mainstays like hoodies, trench coats, bomber jackets + jeans, designer Demna Gvasalia figured to have the actual makers of these items to throw them onto their drawing boards in order to deconstruct them perfectly. 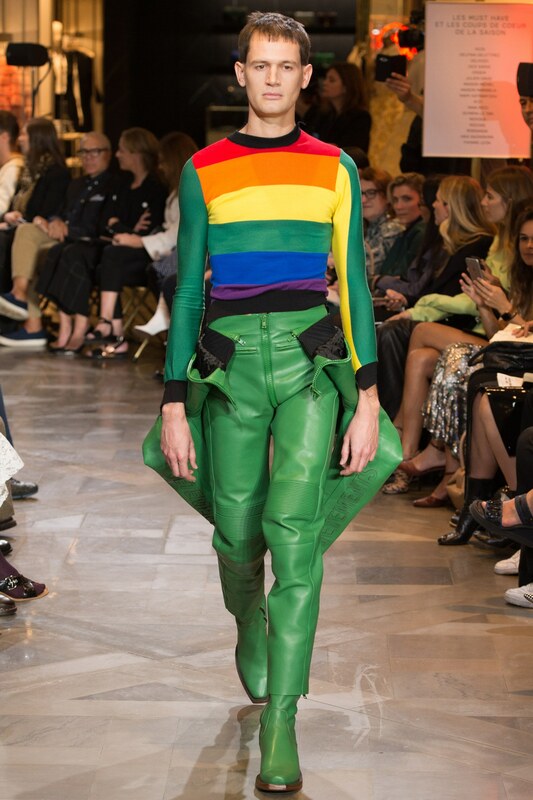 “We thought we’d go straight to the brands who make all these things best, + ask to do something in our way with each one,” Demna told VOGUE RUNWAY. 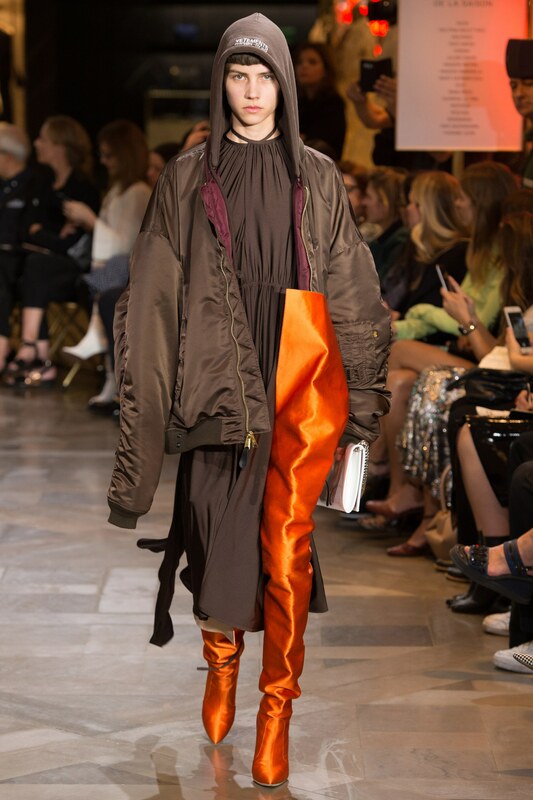 With footwear, Vetements had everything from flats, leather booties, satin pumps, thigh high leather boots + waist high duchess stiletto satin boots thanks to Manolo Blahnik. Demna said, “We’ve done thigh-high, so we asked, could you go waist-high this time for us?” The bonus, of course, was Manolo’s personal touch added to the Vetements collab by autographing his classic satin pumps in bleach. But what’s genius here is how they styled their looks with the longest of boots. 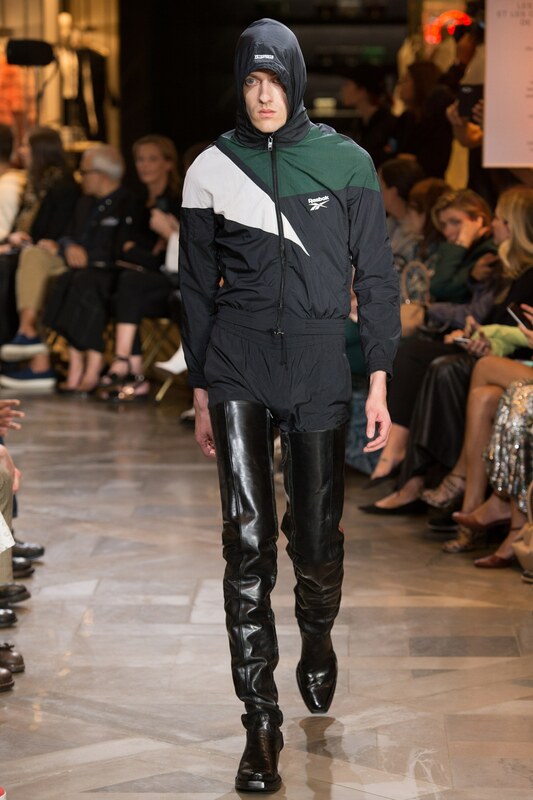 The thigh high leather boots in black were worn over a Reebok nylon tracksuit, which gives that throwback a whole new POV. Whereas the waist high Blahnik boots in jewel tone colors were paired with everything from sheer maxi dresses to one sleeve midi dresses. 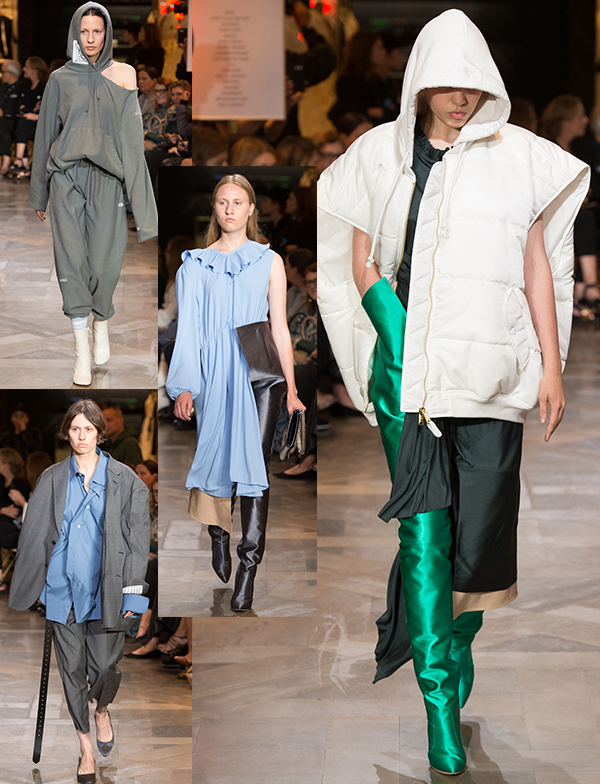 The play in silhouette, a Vetements guarantee, was seen throughout the collection with oversized items including huge overalls, bomber jackets with extra long sleeves + a goose down jacket comprised of two jackets fused together to create a huge pillow effect. 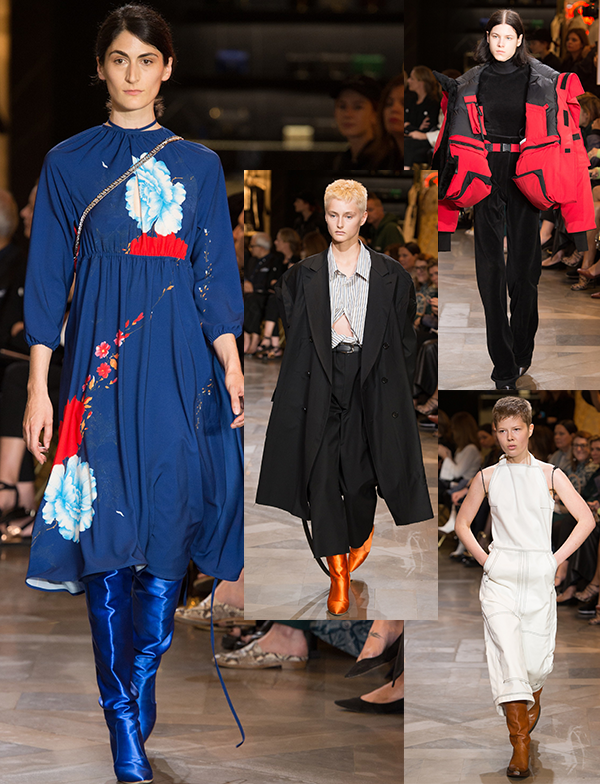 The men’s pantsuit oversized proportions paired with an oversized button-down shirt replaced the oversized shoulder pads look for distorting its silhouette, pulled together by an extra long leather belt. There were leather pants with leather jacket sleeves that looked like they were part of a jacket tied around the waist, when in fact, they were zippered to the pants which made for an interesting effect. One of my favorite pieces had to be the Juicy Couture collab using their signature stretch velvet for skin-tight catsuits with the one sleeve embellished with a crystal design along the forearm, complete with a stretchy black glove. 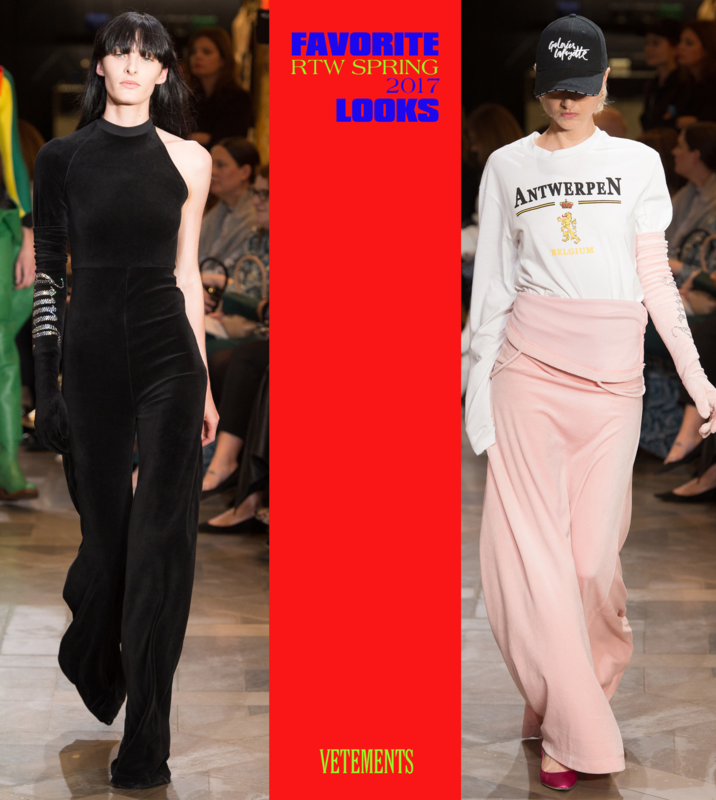 As per usual, I retained a smile throughout viewing all the looks + can’t wait to see what Vetements has up their sleeve for next season’s collection.